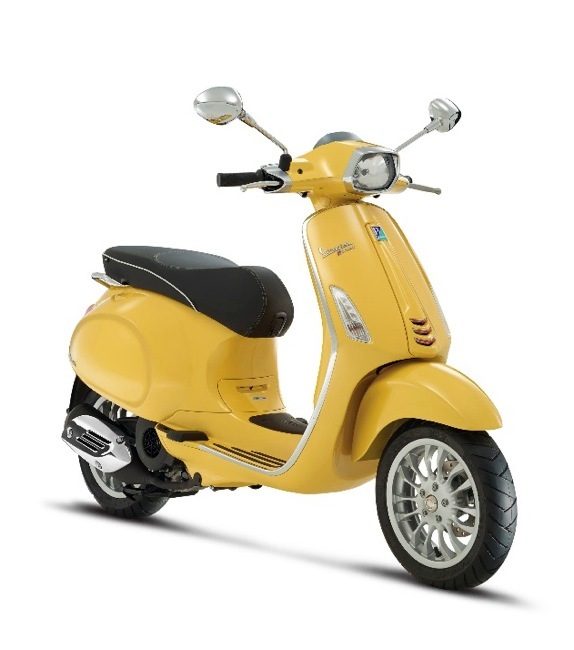 Vespa have released the final piece of the Primavera puzzle. The new sporty Sprint. Vespa have released the sprint in Rome this week. The Sprint namesake is heavily represented in Vespa’s history and we see it used here on Vespa’s latest model. 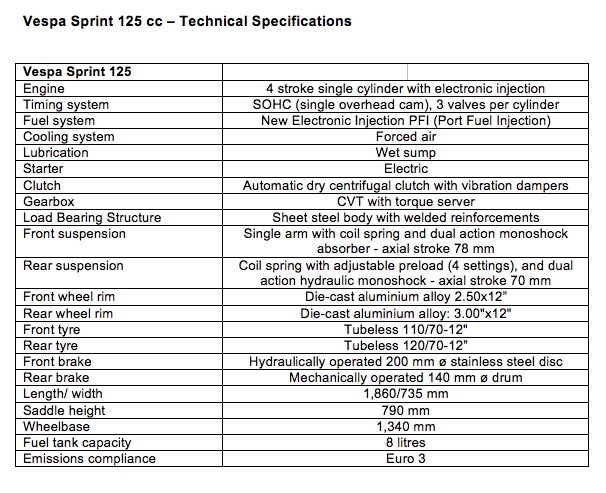 The Vespa Sprint shares all the technical upgrades as seen on the Primavera. The new one piece steel frame has superior rigidity over the previous LX and the new front suspension system enhances the Sprints ability to absorb bumps. Other major upgrades include a lower seat height and more room in the footrest area. The battery now resides in the floor so there’s more room under the seat. Instruments have been updated as have the mirrors. Lights have been enhanced with what is becoming the norm, LED runlights and a rear LED tail. The front headlight is square, a direct play on the past. There's also a new seat and the piping is a nice touch. The 3 valve engine is mounted in a different way to reduce vibrations and increase comfort. The big difference though is the Sprints adoption of 12 inch wheels from the 946. 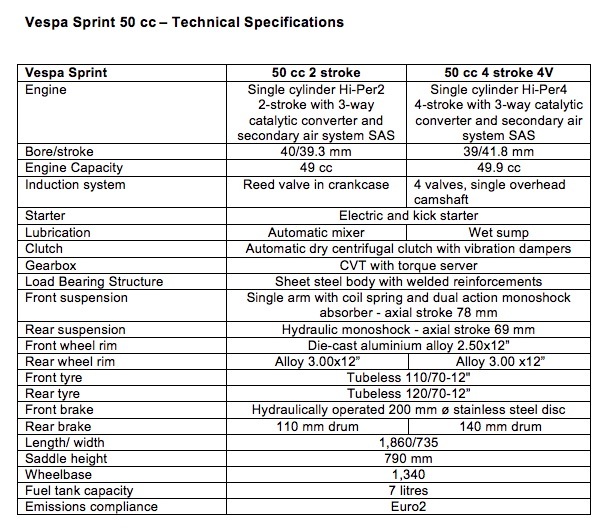 The Sprint will be a massive leap forward for Vespa. Larger, more comfortable and better handling that will help make the most of the new 3 valve engines. It also comes with a brushless starter motor for silent starting. At a guess, the Sprint will most likely make it here a few months after the Primavera launch in April. Price and final capacity for our country are yet to be determined or announced. We may be lucky and get a 150 cc version, we will wait and see. 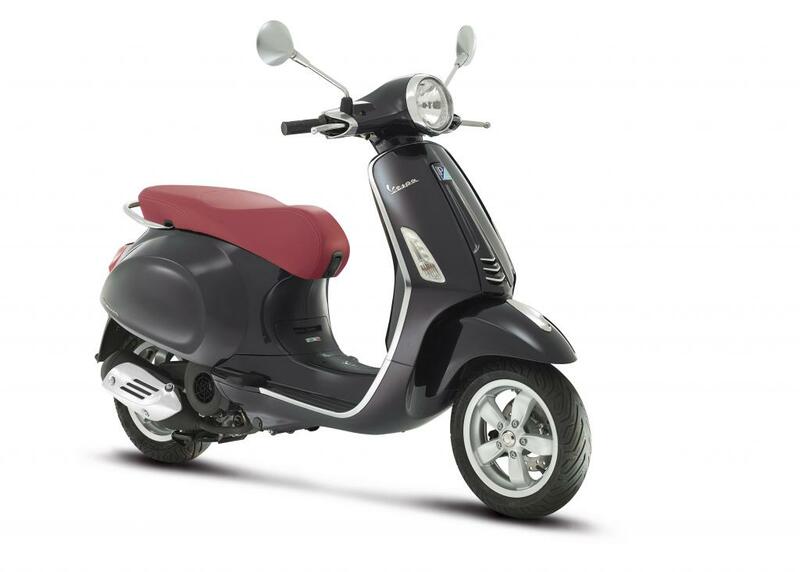 The brand new Sprint is the most sporty and dynamic Vespa “small body” available. 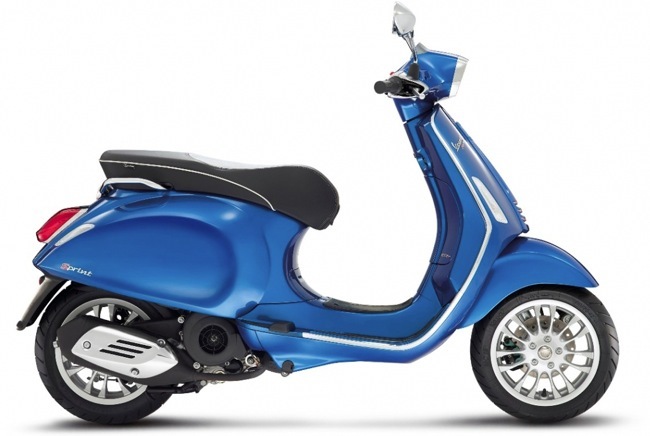 Its name recalls concepts which are intimately tied to the sporty Vespa's of the ’60s and ‘70s. The new Vespa Sprint embodies the heritage of the fastest and most youthful Vespa's, providing those same essential and indispensable elements that made it so successful with young people such as the sport design saddle and the rectangular headlight, details which the Vespa Sprint shares today. Just as the Vespa Primavera replaced the popular and widespread LX version, the Vespa Sprint replaces the Vespa S (the more sporty version of the Vespa LX), thereby continuing the Vespa tradition of using the same solid, tried and true technical base to create two significantly different models in terms of variation and target rider. 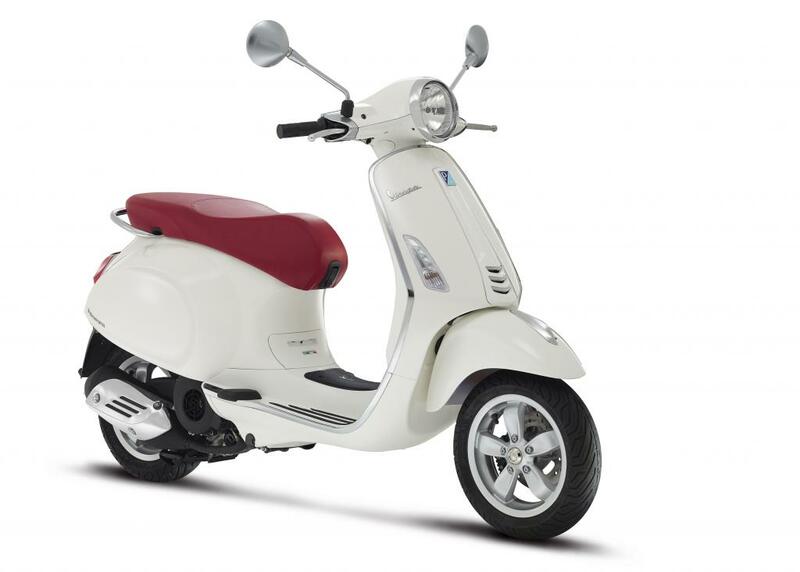 Vespa Sprint is a child of the same design that gave birth to the Vespa Primavera. A cutting-edge project that uses the best available technology and an absolutely exceptional design. It is a true revolution with respect to previous Vespa small body generations. With the goal of guaranteeing the same ease and lightweight qualities of the previous Vespa S, but setting new standards in terms of comfort, space, riding pleasure and safety, Vespa Sprint is a complete revamping of shape and size, carrying on the path begun by the Vespa 946. The overall dimensions are still similar to those that marked the success of the Vespa LX and Vespa S, but an increase in some fundamental specific dimensions optimises the ergonomics, habitability and ease of use. 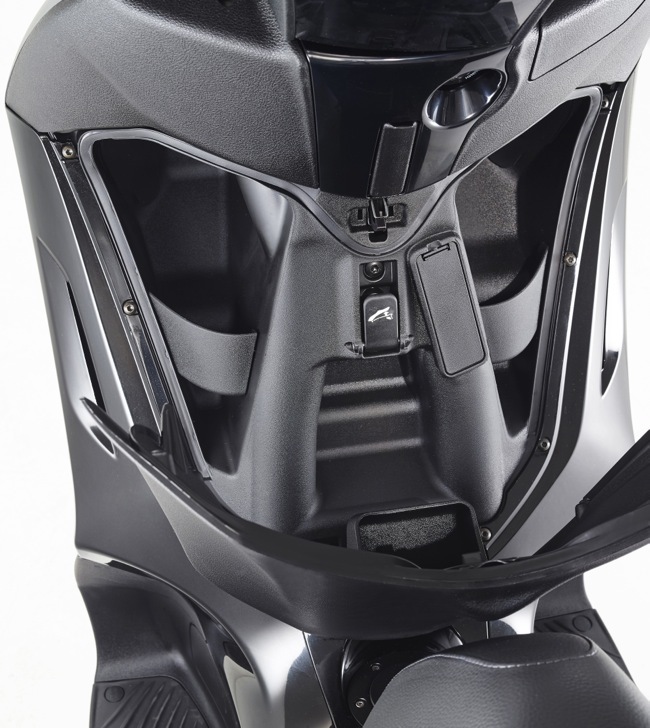 The rider now has more legroom behind the shield and a new footrest that facilitates placing both feet on the ground, thanks in part to its particular shape. The proverbial Vespa easy handling is still ensured by the compact lateral size, but also by the reduced saddle height, just 790 mm from the ground. The tail is again pointed and tapered, just like on the first prototype that inspired the name "Vespa" because of its similarity to a wasp. In it, the extended taillight also helps to give the body a streamlined appearance. The flat, two-up saddle is comfortable and spacious and has double stitching in accordance with customary refined Italian leather.. 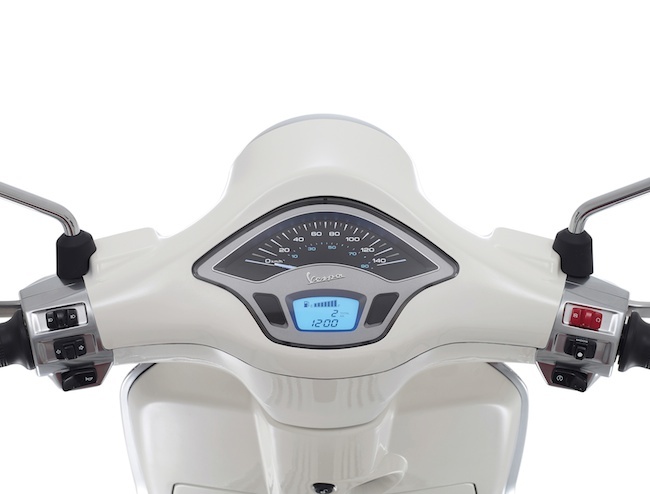 The rear is surrounded by the passenger handgrip, made in sturdy and reliable chromium piping which on the Vespa Sprint is more square-shaped, in line with the sporty set up of the vehicle. Vespa Sprint is available in two displacements and three different engines: two 50 cc (two or four stroke) and a 125 cc with 3-valve timing that represents the cutting-edge of technology, performance and minimum fuel consumption and pollution levels. It is a single cylinder 4 stroke air cooled engine with 3 valves (2 intake and 1 exhaust) single overhead cam and electronic fuel injection. It was designed and built in the Pontedera plant, in some of the most advanced research & development centres in the world, with the goal of increasing performance and fuel economy and lowering polluting emissions. To ensure optimum performance levels, a painstaking study was carried out to reduce friction and improve the fluid dynamics. The new crankshaft, with reduced button and bench capacity, the pivoted cam axle on bearings and the roller rockers have made a significant improvement in operating friction, all to the advantage of performance and fuel economy. The bore and stroke values (respectively reduced and increased in relation to the previous 4-stroke engines) were designed to benefit torque and acceleration response. The new free wheel electric starter, more quiet and efficient, goes perfectly with an engine so rich with technological content. Also, the automatic dry centrifugal clutch has been calibrated with the goal of maximising performance and fuel economy at low speeds. Vespa Sprint uses a new variator that reduces engine speed before shifting, improving fuel economy and comfort without sacrificing the excellent acceleration and pick-up performance, a stand-out characteristic of this long-stroke 4-Stroke engine. The 3V also has the important advantage of weighing less than its 2V predecessor. The extremely low fuel consumption figures (up to 64 km/l at an average speed of 50 km/h) and lengthy maintenance gaps (service every 10,000 km) mean very low running costs. First pictures of the new sporty "Sprint" by Vespa. Sprint features 12 inch wheels front and rear. First pictures have surfaced of the new Sprint or what will be the sports version of the Primavera range. The Sprint will feature 12 inch wheels just like the 946, it will also feature a new digital/analogue dash. Like the S model before it, the Sprint will use a square headlight, a modern take on the past. The Sprint will also receive all the upgrades of the Primavera - new frame, seat, style. The Primavera will hit Australia in April, no word yet if the Sprint version will launch at the same time or down the track. We do like the look of those new alloy wheels, if they fit, I can see a few sets ending up on GTS scooters around the nation. It's on again for 2014, Canberra's Auto Italia is on this Sunday. 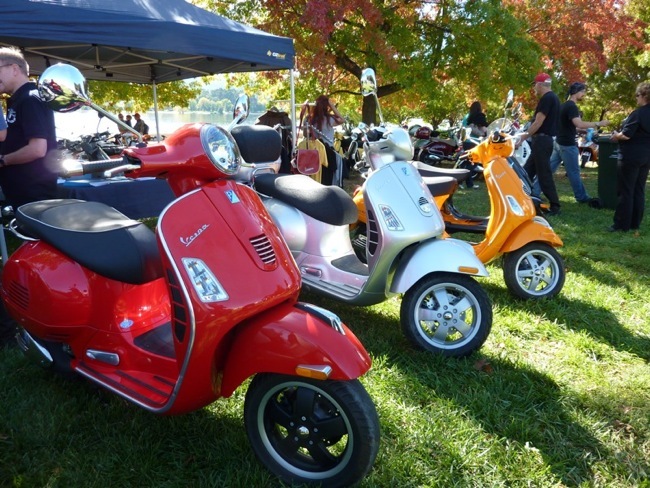 Come and view a selection of Italian cars, motorcycles and scooters this weekend on the lawns of Old Parliament House. For us scooter enthusiasts there will be a nice selection of classic and modern scooters to browse. You can even enter the show by registering for only $5. Classes for scooters include Best Classic Scooter, Best Italian Designed Scooter, Best Automatic Scooter and Best P-Series Vespa. Each winner will be awarded an individual trophy. This years Auto Italia celebrates 100 years of Maserati. A new design path by Honda. 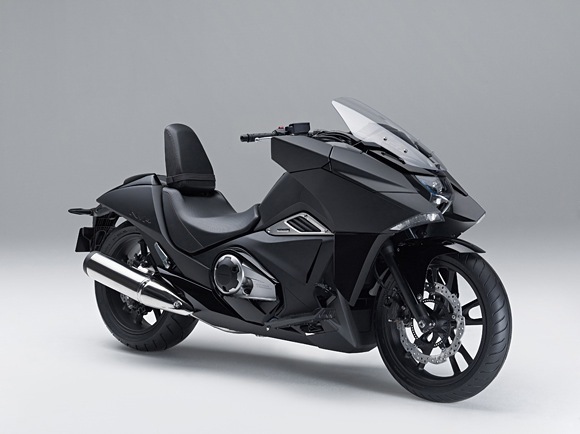 Honda release the new NM4 at this years Tokyo Motor Show. 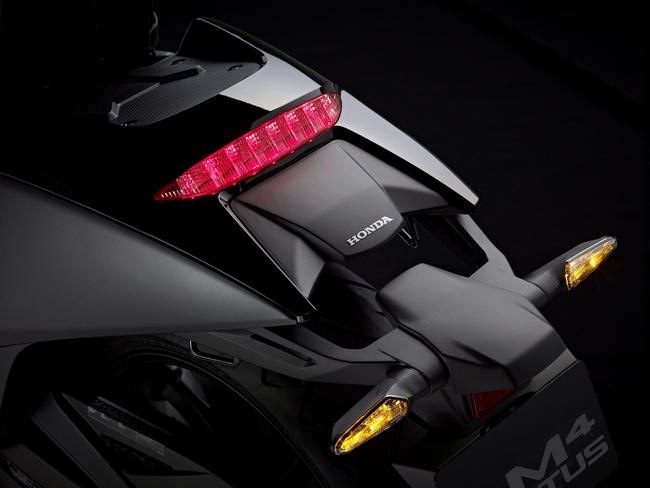 Honda has taken a young group of designers and used Japanese animation as the inspiration behind the new NM4 Concept. The purpose was to take a new design approach with many lines never before seen on a motorcycle. The base for the MN4 is Honda’s own NC750. New features includes a dash that changes colour depending on what auto mode you have selected. The stealth fighter front end contains unique, fairly large storage compartments. 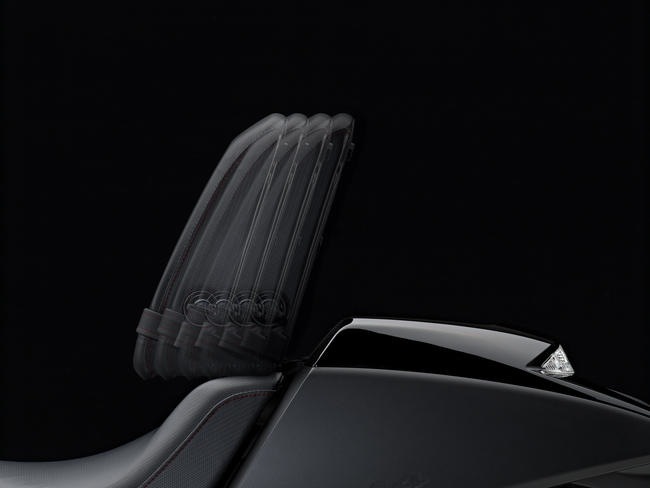 The seat includes a folding design that doubles as a backrest for the rider or a seat for the passenger. The front headlight is all LED. The weight distribution is 49% on the front and 51% to the rear. The engine is tilted forward for a lower centre of gravity. The engine and transmission is as seen in the new Integra, the 745 cc parallel twin and Honda’s 2nd generation DCT. Two versions were on display in Tokyo, the standard NM4 and a version with luggage, the NM4-02. See what Honda had to say below. The NM4 was displayed as a concept design yet the NM4 will actually go on sale in Europe later this year. Honda Exhibits World Premiere of New Concept Model "NM4"
The NM4 was developed under the keywords of "the Neo-futuristic" and "COOL," pursuing new, unique styling. 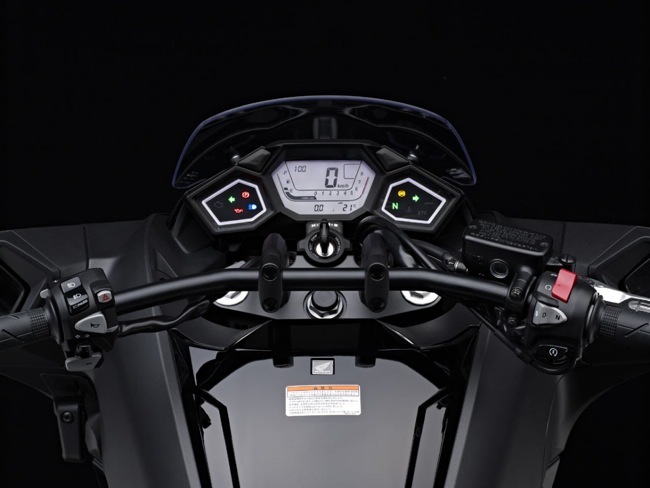 This NM4 was designed to realise two points; the design concept "the Front Massive Styling" and "the cockpit position" focusing on the sense of unity with the rider, that the rider can smoothly get into the vehicle. The low-setup cockpit position and adjustable backrest provide an enjoyable new riding feel. The instrument panel was designed to provide clear readability and fun riding, as if the rider was experiencing part of a movie scene. 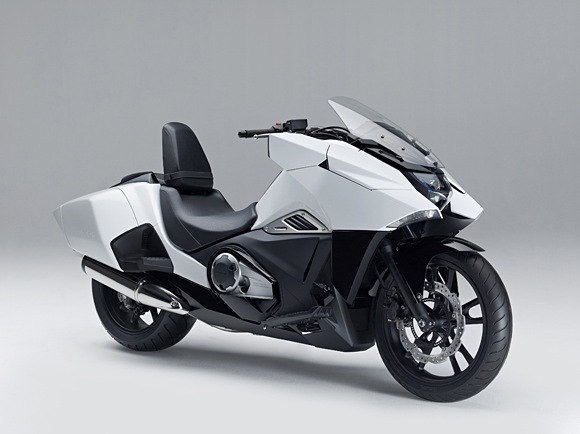 Two NM4 types were unveiled at the motorcycle show; the simply-configured "NM4-01" which emphasises its wide, dynamic rear tire and attractive low silhouette, and the "NM4-02” which emanates a unique presence and features a prominent rear design (containing utility boxes on each side of the rear body). Low cost 3-Wheeler coming to Australia in late 2014. The Tricity also makes its debut at this weekends Moto Expo. 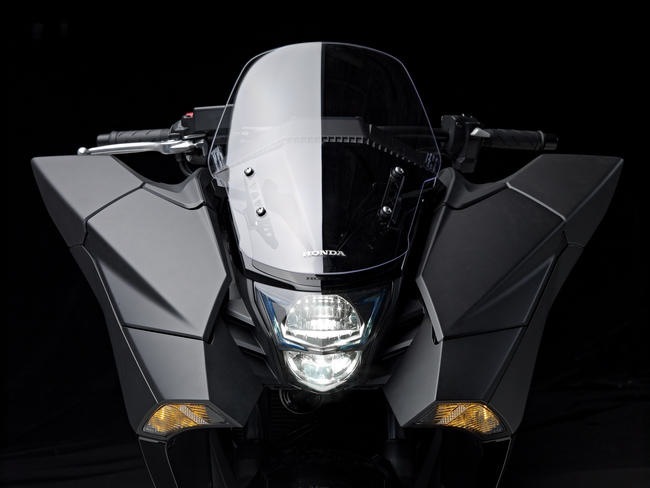 Scootersales.com.au : The Yamaha Tricity was first seen at last years 2013 Eicma show. The official world press release from the show can be seen here. View the official Yamaha Tricity video here. 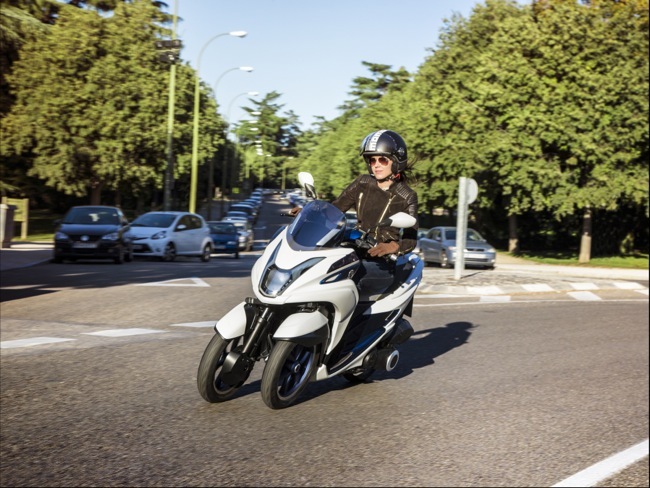 The Tricity is the first of a number of affordable, agile, compact, light and practical new models, and it is Yamaha’s intention to make this the new ‘standard city commuter’. 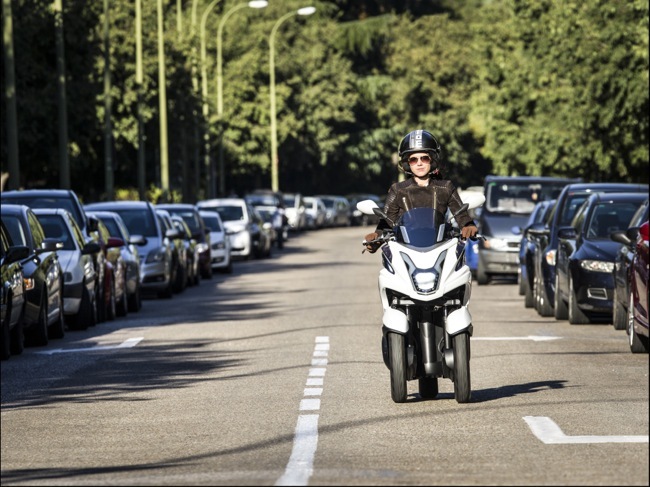 The traditional two-wheel scooter is widely recognised as one of the most cost- effective and time-efficient forms of transport, yet many commuters all over Europe continue to spend precious time and money on public transport or to commute by car and spend hours each day stuck in traffic jams. A huge number of non-scooter riders would like to be able to enjoy the convenience, practicality and cost-savings that go with two-wheeler ownership. Yamaha believe that the Tricity's confidence-inspiring design and fun-to-ride character will open the door to non-scooter riders who are looking for an alternative method of urban transport. 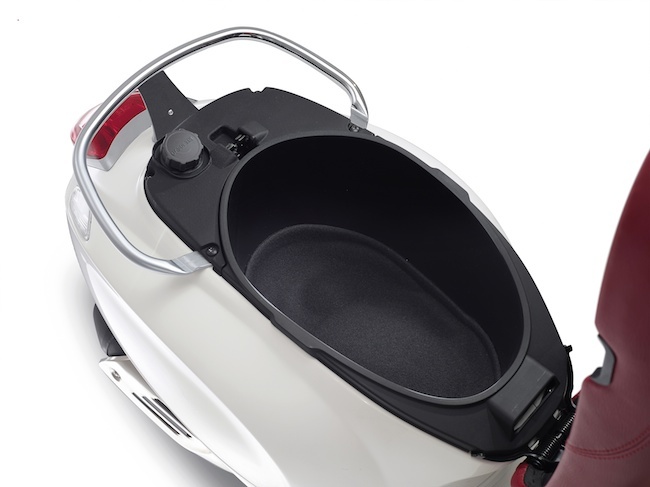 The all-new Tricity is a Leaning Multi-Wheel (LMW) which is specifically designed to attract a large proportion of scooter and non-scooter users, as well as former riders, to a new market segment. Tricity represents a completely new approach to the multi-wheel category. The overall concept and design behind this new LMW has followed a completely different development path in comparison to the current 3-wheel models that are available in the market. 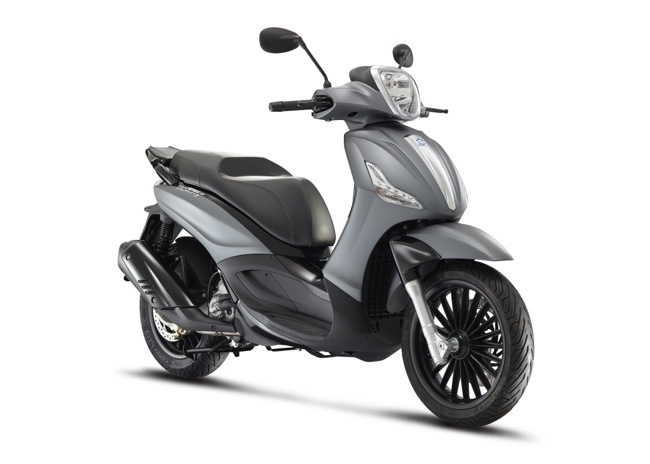 What makes the Tricity exceptional is the fact that it is significantly lighter and much more compact than existing 3-wheel models, and Yamaha believe that its remarkable agility and easy handling character will make it attractive to a wide range of existing scooter riders as well as non-riders who have yet to enter the scooter world. 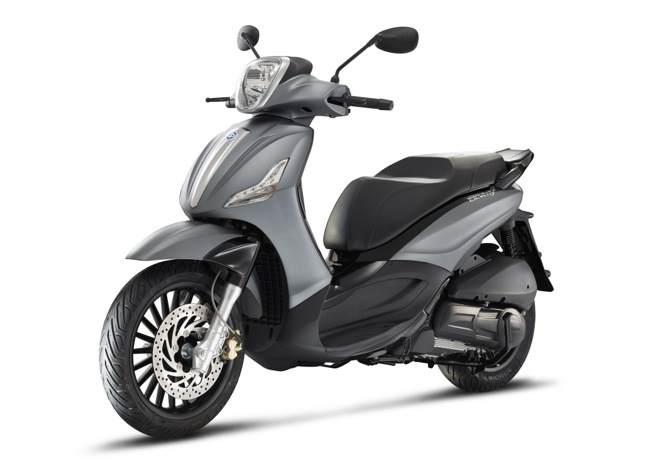 With an approximate weight of only 150kg, the Tricity is comparable to a small to medium sized 125cc two-wheel scooter. 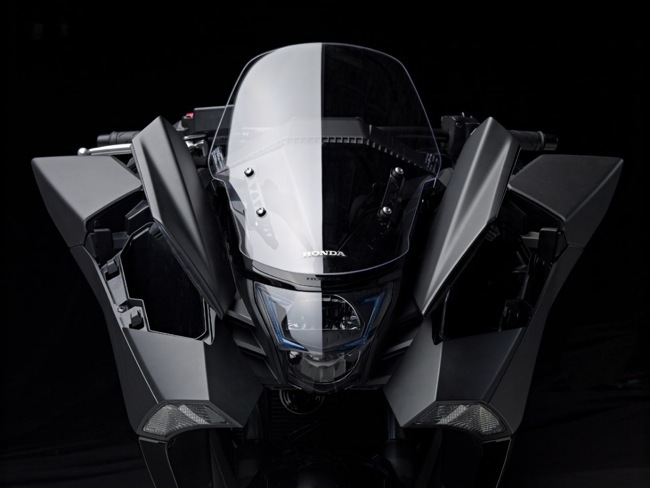 The key objectives that our design team set out to achieve were agility, compactness, lightness, practicality and affordability, and in all areas the Tricity has met Yamaha’s requirements. One of the most important features on the Tricity is the fact that its overall size is compact - including the width of the two front wheels - allowing the to enjoy optimum manoeuvrability in dense city traffic. The new Tricity is powered by an automatic transmission 125cc 4-stroke engine that offers the best balance of performance, economy and weight. Practicality is another strong point on this new 3-wheel model, and there is a generous storage compartment beneath the flip-up dual seat that is the ideal place to carry a helmet or provisions. Potential customers can be sure that the Tricity will be built according to Yamaha's demanding quality standards. However, one thing that will surprise everyone is the fact that this all-new Yamaha three-wheel model will be priced to be the most competitive model in the class. In fact, YMA will be offering this new mobility model at a very competitive target retail price that is potentially less than the amount that many people spend to commute to work over one year on public transport. More details about release timing and pricing will be revealed soon. Vespa Australia has confirmed the exciting new Primavera's first public appearance in Australia will be at the 2014 Brisbane Moto Expo having air freighted over a sample of the bike in time for the event. Parent company Piaggio went to great lengths to keep Primavera under wraps prior to the Milan show last year where it was first shown and the Moto Expo will be the first chance to get a sneak preview of the new model in Australia. The new Primavera, Italian for the season 'Spring', provides a fresh, new look to replace the popular LX model, a design close to 10 years in production. The Primavera name is highly respected in Vespa history having graced the famous marque as a 125 from 1965 to 1992. 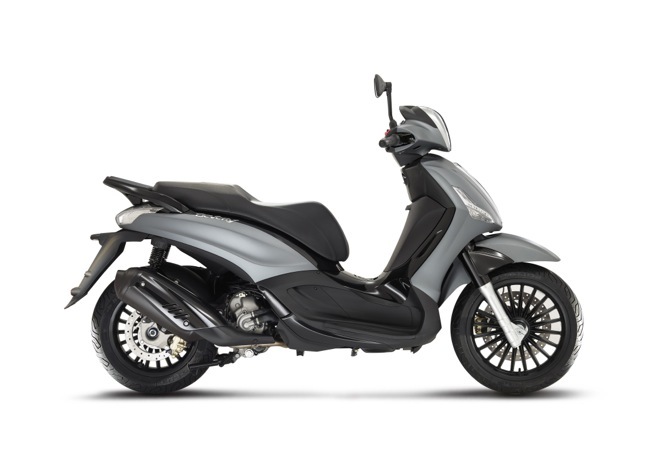 The name Primavera now returns to emphasise the high regard and confidence Piaggio hold for this new model. Primavera takes shades of styling from the beautifully sculptured 946 in a more compact overall design highlighting urban practicality coupled to a powerful and efficient engine. 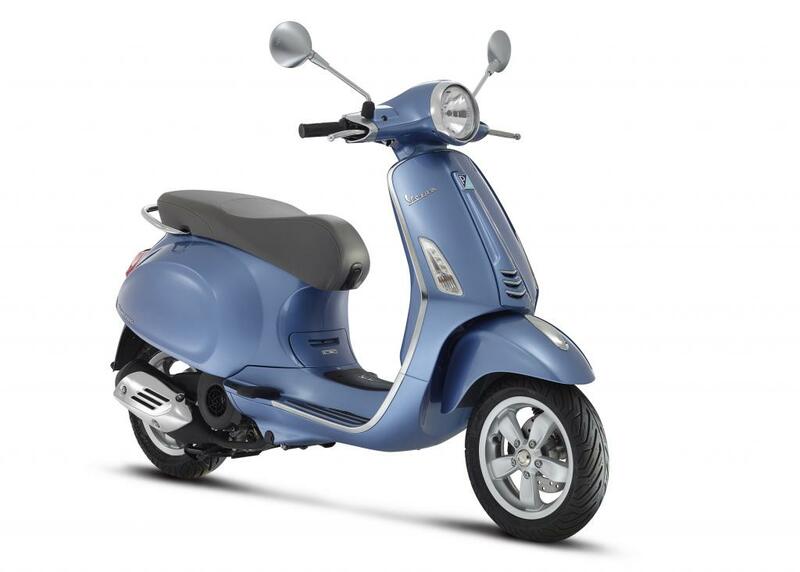 Vespa's style is fashioned around its all steel body and Primavera utilises latest technology to increase frame stiffness. A more tapered tail draws references from the original body design which led to the now famous name Vespa (Italian for wasp). A contoured floor board allows better rider leg to ground comfort while stopped. The new rear quarter panels are more fluid and carry a stylish rib, removing the need for a lower trim as seen on previous models. The front horn cast takes on a taller, more slender design and compliments an overall sleeker look. Importantly the design is built around Vespa's next generation 3 Valve engine utilising a new double rear swing arm design to further reduce vibration. A longer wheel base and new look 11" front and rear alloy rims add to rider comfort and confidence in handling. Also redesigned are the new handlebar covers with brushed chrome switch block holders and chrome headlight bezel. A new speedo is fully electronic with digital and analogue readings. Under seat storage increases from 14.3 to 16.6 litres and the engine immobiliser is fitted as standard. For parking there is the addition of a side stand with safety lock out switch and front led running lights highlight visibility. The service periods are industry leading 10,000 klm and Primavera comes with a 2 year warranty. You can see the new Primavera 150 at the Brisbane Moto Expo from Friday 21st - Sunday 23rd of March. 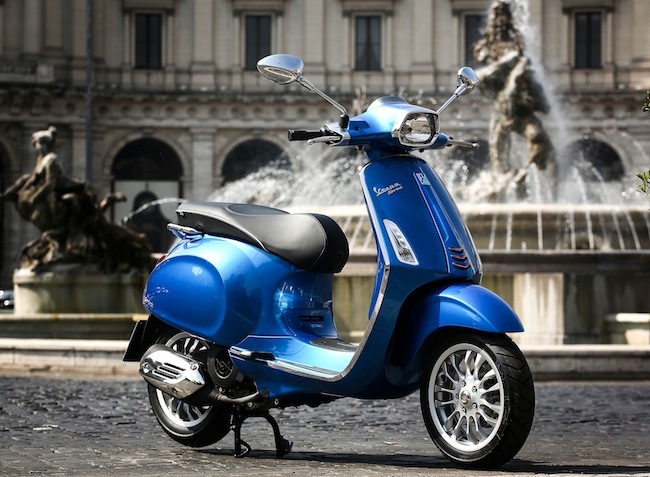 This weekends Moto Expo Brisbane will be your first chance to take a look at the all new Vespa Primavera. 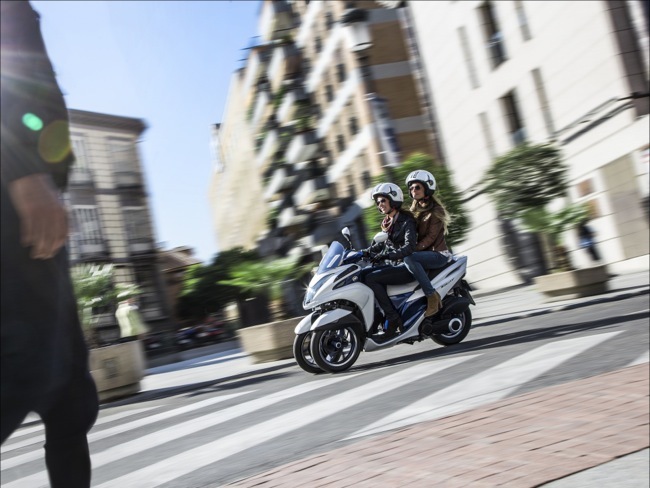 The Primavera is Piaggio’s replacement for the LX range. 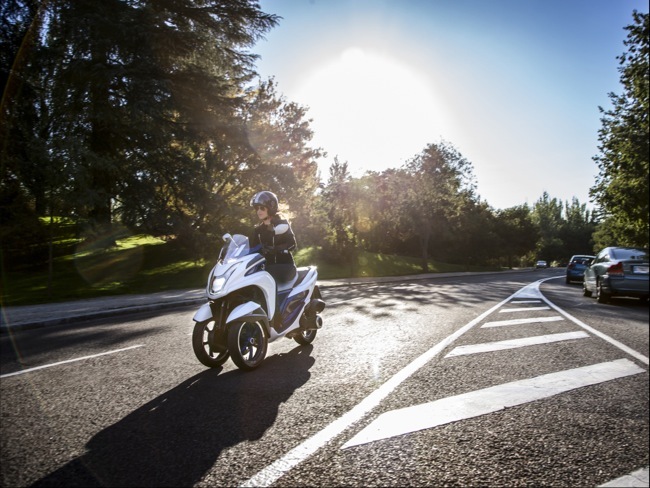 The Primavera is an all new scooter that features a host of advancements over the outgoing LX. Advancements like a larger rear wheel, a new one piece metal frame and a revised larger underseat storage area that sits under a new reshaped seat. We ran a full press release when the Primavera was first launched at Eicma last November. You can see that here. You can also view a series of official Primavera videos including how the new model is made. See that video compilation here. It does look at this stage that we will see the new Primavera making its way into dealers late April. Early pricing indicators are $5290 for the 125 and $5,990 for the 150 cc version. It’s off and running for Kawasaki’s new commuter scooter. Europe only, with further media inside. 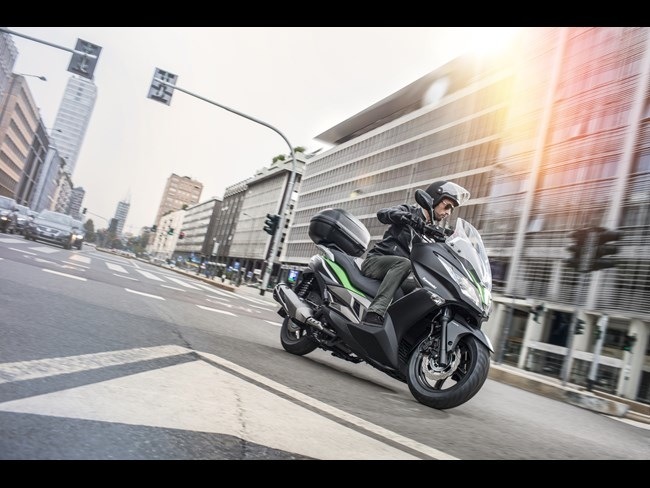 Here we have some further media on Kawasaki’s new J300 scooter. The video below outlines the many features and benefits, although some of these might not be all that ground breaking. The J300 was launched only last month in Europe and already the sales offers have commenced. 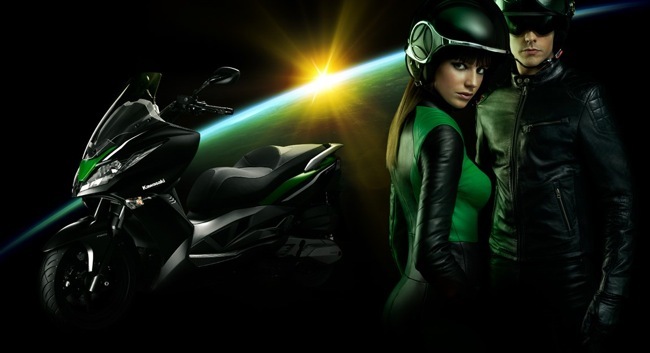 Kawasaki is including a free box and increased warranty across the range. The range itself consists of the standard colour J300 or the special Kawasaki coloured J300 S.E. Both models can be optioned with ABS and both models sell for just under $5000 euro. Based heavily on Kymco’s Downtown 300i (except for the front "Z" family design), the J300 is Kawasaki’s first foray into scooters. 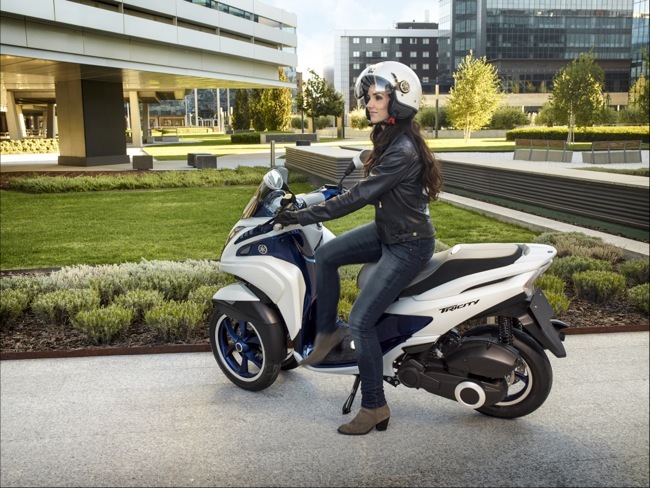 In further European news, Piaggio release the new look sporty Beverly 125 and 300 S.
Whilst we are not expecting any all new models from Piaggio this year, we should expect to see more revisions like the Beverly S being launched. In Australia we only range the Beverly Sport Touring, whilst in Europe the Beverly is sold in both luxury and sports versions. The Sport is a revised take on the luxury IE version that’s available in a 300 capacity. The S (Sport) will be available in both 125 and 300 versions. The Sport is an exercise in style, so matt finishes and revised paint on the wheels and mirrors. Different plastics on the legshield and engine cover. Matt finishes look to be all the rage for Piaggio, you can see the same effect being used across anything with the prefix “S” after its name. For example, in Europe, Piaggio ranges the MP3 and the Yourban in a Sport version. Both are available in matt colour schemes. The S version sells for a few hundred Euro under the luxury IE version. In Australia, the Beverly Sport Touring 350 was launched in Australia late last year and continues to be well received. You can see more on that model here. Go to Pompeii with Aprilia. Get free movie tickets with any scooter purchase. 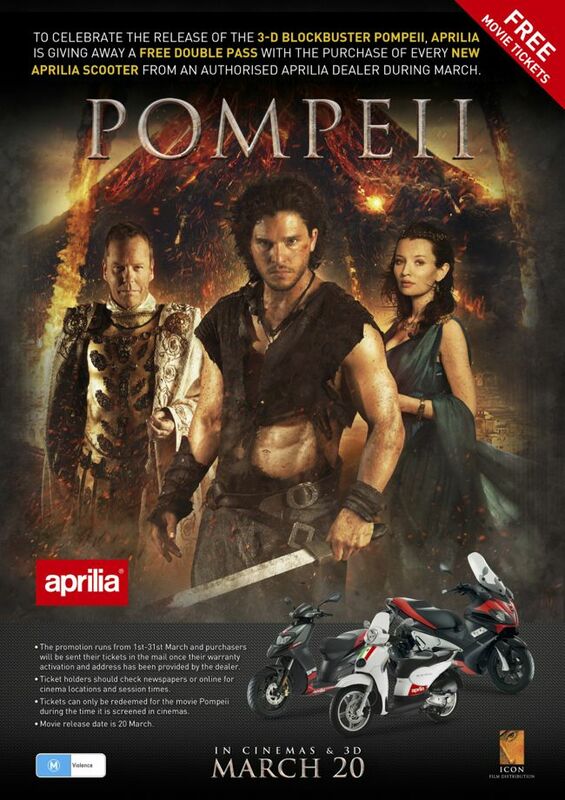 To celebrate the release of the 3-D blockbuster Pompeii, Icon Film Distribution and Aprilia will be giving away a free double pass with the purchase of any new Aprilia Scooter purchased from an authorised Aprilia dealer. 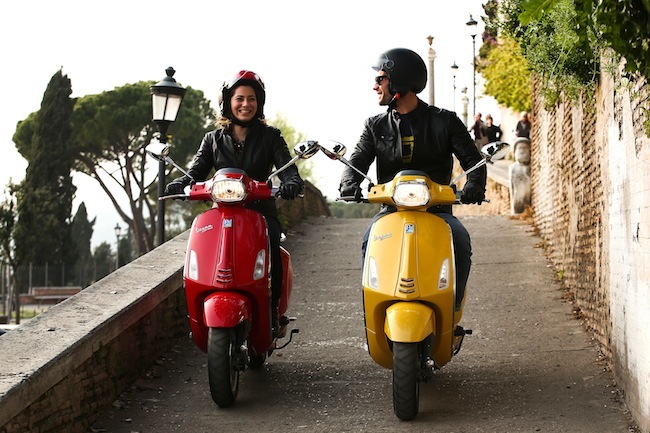 The promotion runs from 1st - 31st March and purchasers will be sent their tickets in the mail once your dealer warranty activates your scooter purchase. Ticket holders will need to check newspapers or online for cinema locations and session times in their area. Tickets can only be redeemed for the movie Pompeii during the time it is screened in cinemas.